Summers are my time. I love the heat and hate the cold. For me, summers are that magical time of year when heat is freely available and all I have to do is step outside into a powerful sunbeam and let the warm seep into my bones. But sooner or later, life forces me to go inside. Inside there are air conditioners. Not just ordinary sit-in-the-window air conditioners. These are Texas sized air conditioners and they are being controlled by Texans. Texans cannot be trusted with air conditioning. They get completely out of control and will not listen to reason. Now if you read this blog for awhile, you know I love Texas and I love living here. I’m proud of Texas because most of us feel no shame about being silly or happy or polite to total strangers. Also every time I need to pull out of the Wal-Mart parking lot and into traffic, someone stops and lets me cut in front of them. Every single time. Usually within less than 60 seconds. Texans are by and large sweet people. But they are stupid about air conditioning. Everywhere I go the AC is set to 68 degrees or lower. Now in the fall/winter when the outside is 68 degrees or lower…. everyone is chilly. They wear jackets and won’t go anywhere and complain about how its “too cold”. Picture me giving doing the disdainful eyebrow arch. Because I’m doing it. All of that is why I wear a lot of clothes in the summer time. In my home I wear shorts. When I go out somewhere, I wear pants and boots and long sleeves and maybe even a knit hat. I also wear a hoodie, or I used to. I had a plan for this summer. This would be the summer that I did not spend my days in hoodies. This summer I was going to be elegant. This summer I would dress like a grown up! This summer I would wear nice shawls to stay warm under the air conditioning. So while everyone else knitted and crocheted winter wear, I made summer wear. And a couple of stoles to wear like wraps. The results of this plan have been mixed. On the one hand I receive plenty of complements. When I pile on the knit-wear I “look so sweet” and I’m “adorable in that”. FYI, no one ever told me I looked adorable in the gray hoodie with the bleach stain on the elbow. So I must look more respectable this way. I must look like an actual grown up. That part of the plan has been working out. But I’m cold. Shawls alone are not cutting it. To be fair to the knit-wear genre, sometimes hoodies don’t cut it either. Last week there was one unplanned, spontaneous trip to a movie theater and I nearly died. I had on my shawl and an emergency back-up hoodie (which I keep in the truck) and I was so cold I almost didn’t make it to the end of the movie. But movie theaters are extreme indoor weather zones and I normally wear a winter coat when I go there. So let’s not count that particular near-death-by-AC experience. Still, I’ve been too cold this summer. I find myself all hunched over with my muscles clenched up. My fingers ache. My toes are numb. As nice as the shawls (and stoles and cape-thingy) are, they don’t keep me warm enough. 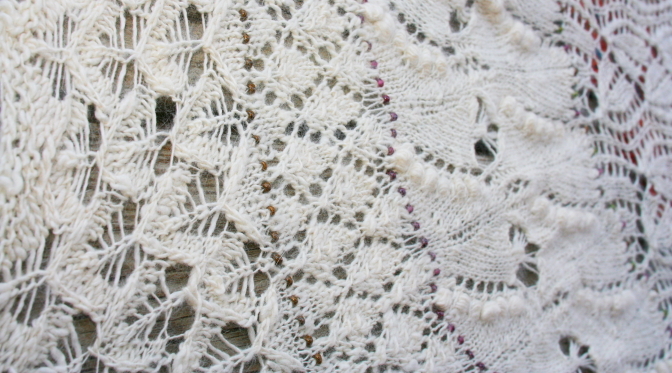 But there is hope for the knit wear in the summer plan. I’ve noticed that when I add knit sleeves I do much better. Sadly I only have two pairs of those. I need more. 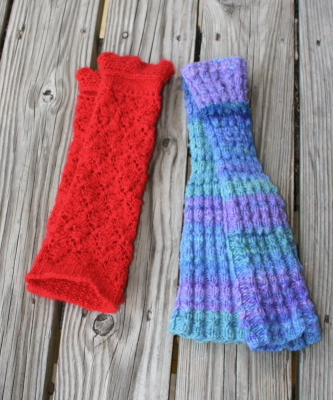 Both pairs of my knit sleeves are made from homespun and I’m kind of proud of they way they turned out. I was going to try for a better picture or two but…. the taking pictures of knit wear came to a sudden and abrupt end. 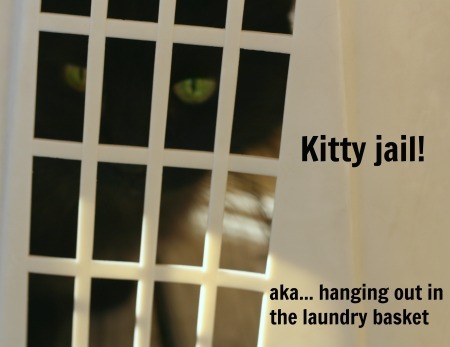 The sleeves had to be rescued from Anti-Spinning Feline Overlord. She will not stay off the homespun. Its pathological. For next summer I think I’ll be making more knit sleeves. I have enough cover up things (I wrote that knowing I have a knit wrap on the needles and a crochet poncho on the hook, lol). Sleeves will be the priority. Naturally, I’ve been wasting time looking at knit sleeve patterns. The multi-color blue/purple pair? Those I just improvised and there is no pattern. But the red pair are Victorian Lace Sleeves by Ava T. Coleman. 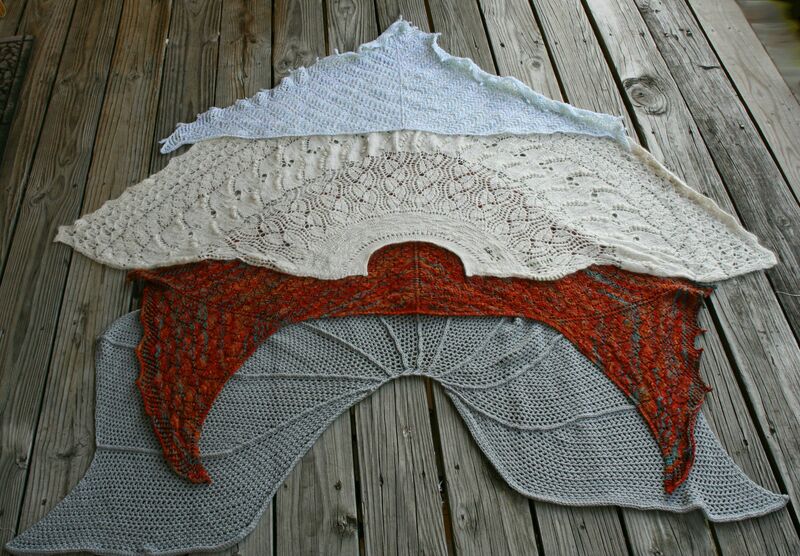 There is only one picture of them on the ravelry pattern page and that picture is of my red sleeves. I guess I’m the only one who made a pair. But it is a nice pattern and I do recommend it. Or something with ruffles. I like ruffles. Yep. I foresee some sleeve making in my future. I guess they are not they most popular knit wear item but I like them. They are easy on, easy off. You can carry a pair in a bag so they are there when you find yourself freezing to death on a 90+ degree summer day. Maybe knit sleeves could be they next in thing! Maybe not. But I’ll be wearing them! 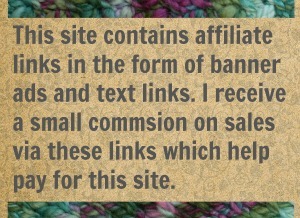 11 Comments on "Summer of Shawls"
Perhaps you should consider making one of these:http://www.ravelry.com/patterns/library/sleeves It’s certainly in my queue! That is nifty. I just love Martina and her designs. She is a good one. And I totally just wasted a ton of time looking at sleeves to match with my TARDIS dress! You’re welcome! I mean… sorry. I might suggest looking at sock patterns as well to use for sleeves as essentially socks are sleeves that are closed on one end. That is a great idea! the leggy part of knew socks would be prefect. Gorgeous stuff! I hear you about air conditioning. 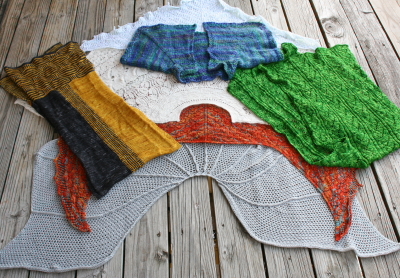 For an upcoming trip, where I will be subjected to the stuff, I’ve made shrugs…for everyone from the grand baby to me. Sleeves used to be tied to the dress…what a great idea to pair them with shawls! Good luck on your upcoming trip! And your family is so lucky to have you looking out for them and prepping with the warm wooly stuff! Tell them Jenn says they need to appreciate you more. 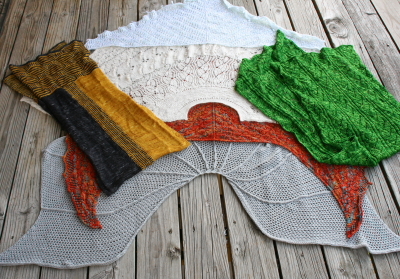 Gorgeous shawls & wraps! We too have the AC crazies that live here in Alabama. I’ve been known to wear gloves to grocery shop (yes in the summer) so my hands aren’t blue when I get to check out. 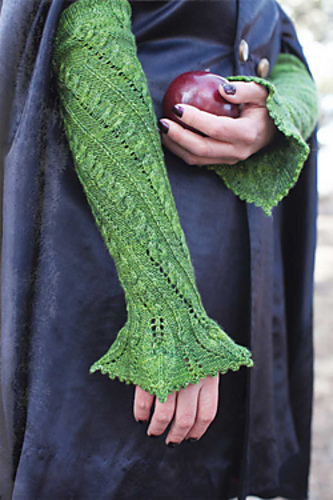 Love the idea of sleeves with a shawl. Your homespun sleeves are stunning.